This entry was posted in Class, Environment and tagged climate change, Exxon, global warming, Rex Tillerson by David Taub Bancroft. Bookmark the permalink. spitballing!!! good gods man.. I must get out my pea shooter.. Let’s see… who shall I set in my pea shooter sights.. Exxon is a good one to start with.. and perhaps the NRA. Oh Sandra. I can always count on you zero in on one particular word and then run with it. I fully support your right to bear pea shooters! The twisted rationale for greed never ceases to entertain. Of course Exxon cares about the poor, they are consumers and employees. Without the poor Exxon couldn’t make the profits they do. The planet on the other hand is not important. 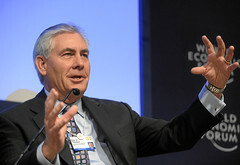 Caring about the planet could cost Exxon’s profit margin. Yes, the poor qua consumers are important to Exxon. They are instruments of enrichment. Even the planet is important, in this narrow sense, as a fossil fuel repository. A very limited form of love indeed.